Following the resignation of Nicholas Murray Butler, Provost Frank D. Fackenthal was named acting president. A Columbia University graduate (A.B. 1906), Fackenthal spent most of his career affiliated with the University, including serving as Secretary of the University and as a member of the Committee on War Research which was instrumental in the early phases of the Manhattan Project for Atomic Research. 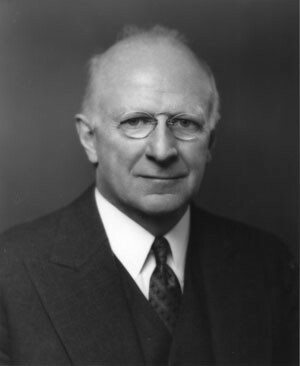 As president, Fackenthal was involved in the creation of the Russian Institute and the School of General Studies and widely credited for the smooth transition to peacetime conditions at Columbia University following World War II. Despite his retirement, Fackenthal remained extremely active as an educational consultant for the Carnegie Foundation of New York and trustee at Columbia, Barnard, Franklin and Marshall College, the Riverdale Country School and International House.